Go ahead and chuckle, but don't let the name fool you. 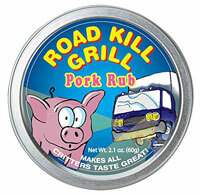 Road Kill Grill Pork Rub is sure to be one of the most tantalizing spice rubs you'll ever try! This amazing dry rub is all about succulent flavor and juicy tenderness. It seals in flavor and moisture when grilling, broiling or roasting. Makes both a great cooking product as well as a great gift! Comes in a 2.1 oz whimsical tin. A proprietary blend of herbs, spices, and secret ingredients. Sprinkle over or rub into any type of pork. Great for grilling, pan-frying and broiling. New staple in year-round kitchens and indoor grilling.